Pre-treating your plants with water filters for organic gardening is the most popular trend to make your plants healthy and keep great care of your vegetation. Most of the organic gardens in town often use the tap water which is supplied to fulfill the vegetation requirements. Until you use rain barrels for collection of large volume of water, you will be required to use the tap water for gardening, but we know that such water is highly chlorinated. This chlorinated water has been design to kill a certain quantity of bacteria, but some bacteria are required for keeping the soil balance and inner shape. We are just going to start with a new environmental friendly water filter which remove all the chlorine and water and soluble metals from the water, this will ultimately help to grow vegetables and healthy fruits with enriched organic metals required. A filter will work for as long as 25,000 gallons of water and then you will be required to refill it and continue the pure water for our garden. This water filter cost you only $35.50 and you can buy from local stores or online. The Vibrant water filter is best eco-friendly filter available for gardening and those guys who love to customize it according to their needs, they can change its design, capacity and other factors in this water filter. 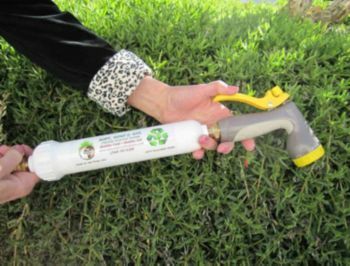 This garden filter can be attached to any garden hose simply and harmful chlorine can be filtered from the water easily. To measure the life of this organic gardening filter, let’s take an idea that water requirement for tomatoes is about 140 gallons in 10 weeks period to get the tomatoes of 20 pounds yield. This GUARDN growing organic water filter will produce enough chlorine filtered water for 1.5 tons yield of tomato crop. Gardening is amongst our top priority areas to keep our environment green and lessen the effects of pollution and hazardous gases in our atmosphere. When you use these garden filters for your potted plants, you will stop adding the salt to your pots and water which will be used for plants will lessen the effects of leaves burning. As for installation of water filters is concerned, they are easy to install and simply screw them to your water bib or your hose. These water filters will require the back washing if you want to clean them, but they don’t need it. In these filtering units, they are also replaceable filters, but it is important that you might not change or replace them until they have worked for 20,000 gallons of water, which is approximately equal to one year usage of these water filters. Gardening filters come in two parts, separated by eight small bolts with Allen wrench. Whey these type of filters? Because they are right priced, eco-friendly and simple to install, efficient at use and do great job, these gardening filters are excellent and you can use them for long time. This filter is quality product with lifetime warranty.